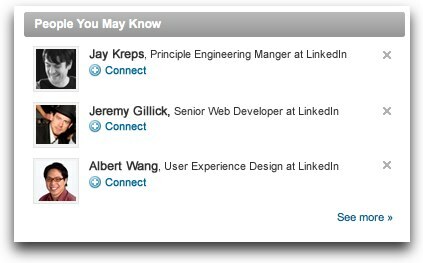 Did you know that “People You May Know” was invented here at LinkedIn? Staying in touch with your current contacts and reconnecting with old or lost ones is a critical part of establishing your professional identity and People You May Know is a powerful way to find those connections. Every day we get lots of great feedback from users on this feature and we’ve been listening! With our revamped People You May Know, we have now taken the power of this product and made it even better by merging it with another powerful feature, faceted search. 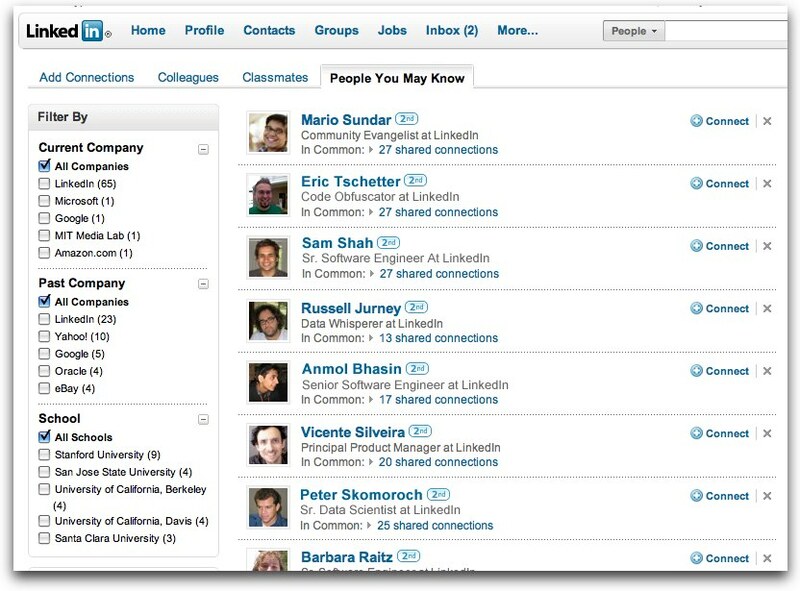 These facets make it easier to filter the list of people you may know by companies and schools. With these improvements, you will be able to page through all of your suggestions on the landing page, and quickly filter them by company or school or see which connections you have in common. How do you get there? Click on the “See More” link on the "People You May Know" box and in just a few clicks you can get through the entire list of people you may know and connect with the the right connections. From this page you can filter this giant list of possible connections in a variety of ways. Maybe you want to filter by those unknown connections currently working at Yahoo. Or maybe you are looking for that long lost colleague who used to work with you at Genentech and also went to school at UCSF. Or perhaps they are working at Cisco these days, but they used to work at Accenture and IBM. Here is a quick video demo that walks you through the enhanced features of the new "People You May Know" experience. 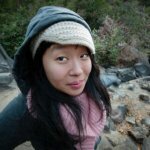 This is just the beginning in helping you quickly find and make those connections. We’d love to hear your feedback on this feature as we roll it out to all of our users over the next few days. Feel free to either leave a comment on this post or send us your feedback via twitter - @linkedin.